Started 'Bo-Kaap Bazaar', a homed-based restaurant and gift shop. Co-Started and managed family owned 'Noon Gun Restaurant'. Started the 'Bo-Kaap Cooking Tour'. Chosen to feature in the '2010 Soccer World Cup' television campaign 'I am 2010', in which Zainie showcased the cooking of traditional 'Tomato Breedie'. Pasella, KykNet, Jou Show met Emo, Wine Route with Bobotie, and Food Consultant for MasterChef SA. Zainie was also featured in many international shows, magazines and other print media. 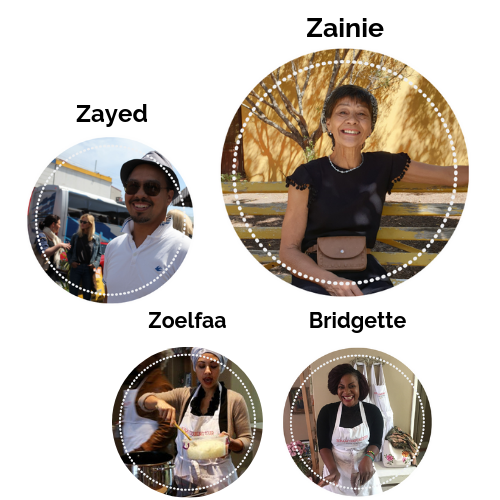 Zainie's well-trained team, will guide you step-by-step through your journey and insight into the Cape Malay culture & cuisine.